Have you ever heard of autoimmune diseases? Do you, like millions of others, actually have one of them? 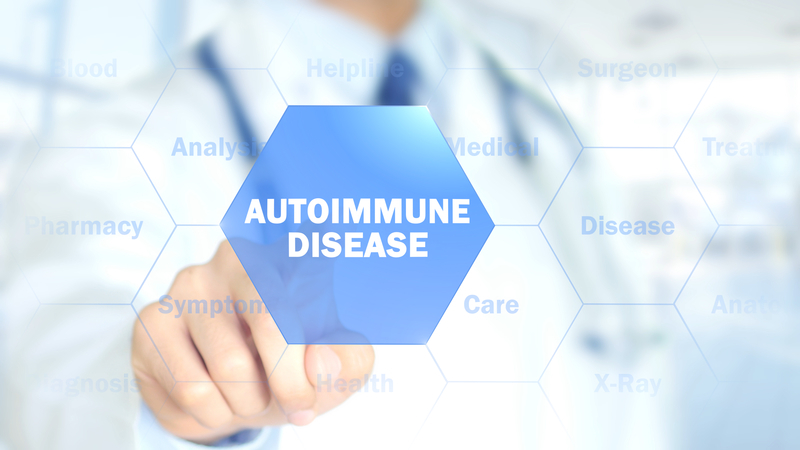 The term Autoimmune Disease is used to describe conditions in which the body's immune system – which is supposed to be defending the body against viruses, bacteria and other invaders – is thought to be involved in causing or perpetuating illness. It's as if the body's defense system has turned on its host. Lupus – When people develop lupus, they usually have inflammation in multiple parts of the body, especially the joints, skin, lining of the lungs and kidney. Sjögren's syndrome – This condition causes dryness of the eyes and mouth due to inflammation and scarring of the glands that make tears and saliva; arthritis, lung disease and inflammation in other organs are also common. Polymyalgia rheumatic (PMR) - Those with PMR are usually over age 60 and have the sudden onset of pain and stiffness in shoulders, neck and hips; it may be a "close cousin" of rheumatoid arthritis. Ankylosing spondylitis – This disease is marked by inflammation and stiffness in the lower spine, including sacroiliac joint; other joints are often inflamed as well. Vasculitis – This term means "inflammation of vessels" and refers to a family of conditions in which blood vessel inflammation leads to bothersome symptoms and, in some cases, organ damage. Examples include temporal arteritis, granulomatosis with polyangiitis, and hypersensitivity vasculitis. Multiple sclerosis – This is a condition in which the lining of axons (called myelin) is damaged by an immune attack; axons are projections of nerve cells that allow them to talk to each other. As a result, the brain and spinal cord do not function properly leading to impaired movement, balance, vision and other problems. Celiac disease – With celiac disease, gluten consumption leads to an immune reaction that damages the small intestine and impairs normal digestion. Other problems, such as rash, joint pain, and fatigue may also develop. Type 1 diabetes – When people talk about diabetes, they are usually referring to Type II diabetes (in which the body becomes resistant to insulin); this type accounts for about 95% of all cases of diabetes. With Type 1 diabetes, an immune attack damages the part of the pancreas that produces insulin leading to too little insulin to regulate blood sugar or the body's use of energy. Organ damage (including the kidney and eyes), frequent urination and excess thirst are common problems. Alopecia areata – This is a skin disease in which an immune attack on the hair follicles leads to patchy hair loss, especially on the scalp. What all of these conditions have in common is evidence that the body's immune system is in some way responsible. For example, a skin biopsy may show immune cells collecting near an area of a rash; or, there may be antibodies circulating in the blood that are targeting normal tissues. In addition, medications that suppress parts of the immune system may be effective treatment. Still, for most of these conditions, the idea that they are autoimmune in nature is suggested by the evidence but difficult to prove; in fact, certain autoimmune diseases may turn out be due to an infection or allergic reaction and the immune abnormalities are just a reaction. Why do autoimmune diseases develop? The immune system is exceedingly complex and decades of research have illuminated some of the ways it goes awry in autoimmune disease. But, for most autoimmune illness – including those mentioned above – the true cause is unknown. The most common (and quite general) theory is that a person with a particular genetic background that makes them prone to immune system 'misfiring' encounters an environmental trigger (such as an infection or a toxin) and that sets off autoimmune disease. For the most part, we don't know the trigger or toxin and in a particular population (or family or even among identical twins) we don't know why some people develop these conditions and others don't. These gaps in our knowledge slow the development of effective treatments or preventive measures. What can be done about autoimmune disease? Treatment depends on the condition but most autoimmune conditions are treated with medications that suppress or otherwise alter the immune system hoping to dampen it down enough to quiet the disease but not so much that side effects (including infections) develop. In some cases, effective treatments are discovered by happenstance; for example, in the 1920s, gold salt injections were first used to treat rheumatoid arthritis because gold had been used as an antibiotic to treat tuberculosis and rheumatoid arthritis was thought to be caused by an infection. In more recent years, the identification of immune cells (such as B-cells that make antibodies) or chemical messages (also called cytokines, such as tumor necrosis factor, or TNF) involved in autoimmune disease have led to therapies targeting these components of the immune system (such as rituximab, an anti-B-cell treatment or infliximab, an anti-TNF drug). The autoimmune diseases are a mysterious set of conditions that vary in severity from the merely annoying to life-threatening. Research is ongoing and has provided remarkable advances in recent years; while effective therapies are available for most of these conditions, cures are not. It has long been predicted that we will soon be able to analyze a person's genes, assess how their immune system is behaving, measure the number and function of immune cells or chemical messengers and put all of this information together to devise a specific, individual treatment regimen that's likely to be safe and effective. We're not there yet.